Since the Stone Ages, groups of native hunter-gatherers have inhabited Africa's rainforests. These people are commonly known as "pygmies," though this is considered a derogatory term. They share a short stature (less than 5" tall) and dependence on the rainforest eco-system. But this is not a monolithic group. Rather than "pygmy," these peoples prefer to be called by their tribal names: Mbuti, Efe, Aka, Baka, Twa Sua. There are some 200,000 - 250,000 native rainforest inhabitants spread across Cameroon, Gabon, Equatorial Guinea, Central African Republic, Republic of the Congo, Rwanda, Burundi, Uganda and Democratic Republic of the Congo. All have separate languages, religions and customs, and all are under threat from deforestation. 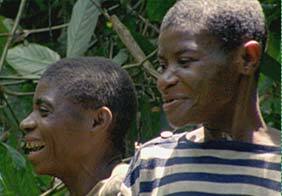 The rainforest people featured in AFRICA are one of the most culturally distinct: the Baka, of southeast Cameroon.